Despite having lived in San Francisco for seven years and working in a tech field, I’ve never actually participated in a hackathon. Since I’m not a developer or a designer, it just never felt like something that I would have much to contribute to. That changed this weekend. 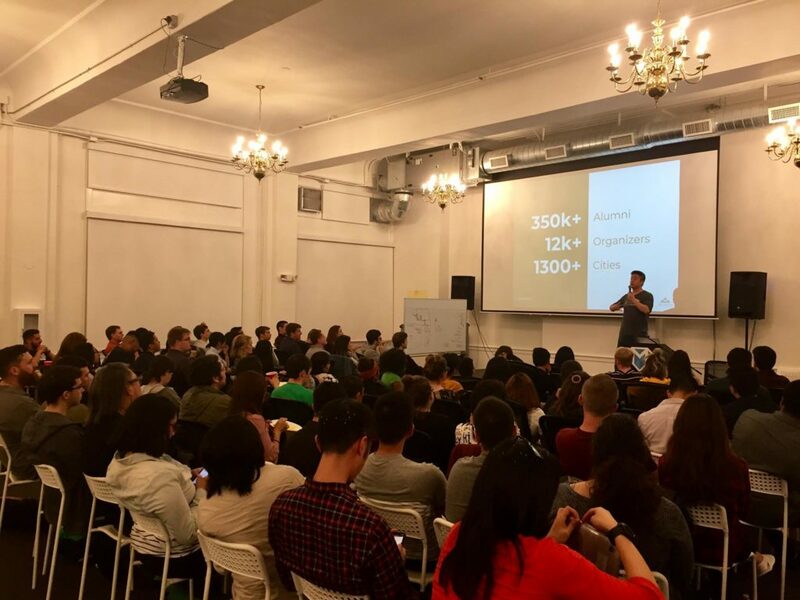 Sounded like Startup Weekend was the place to be, whatever it was. So when I heard that the next Startup Weekend Education was coming up in mid-October, I went ahead and signed up. So that’s how on Friday night, I ended up in my socks in the Make School in Union Square, coming up with a pitch for a product that combined “lamb” and “chandelier.” I was in a large room with 75 other people – all shoe-less because of the new carpeting in the venue – being led in a warm up exercise by our Master of Ceremonies Lee Ngo, a Startup Weekend veteran and edtech entrepreneur. 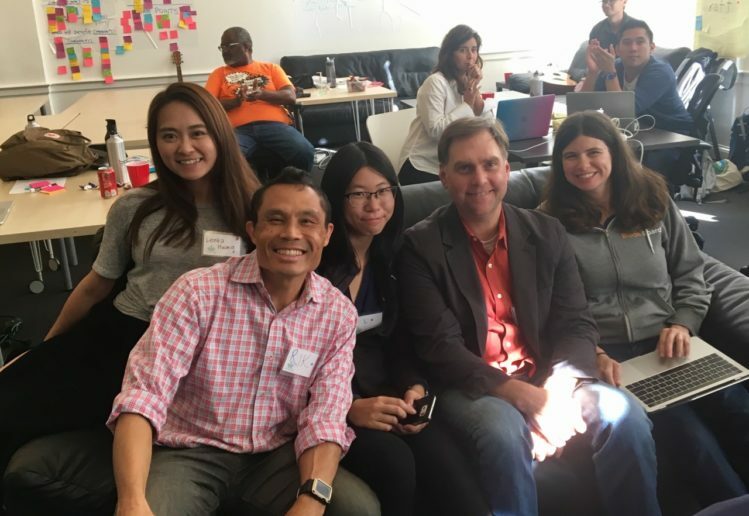 Lee placed us into ten teams randomly, had us pick two random words, and gave us five minutes to come up with a compelling startup pitch for. It was a weird, loud, and fun way to start us collaborating creatively. Then Lee gave us the skinny on what our challenge was for that weekend. 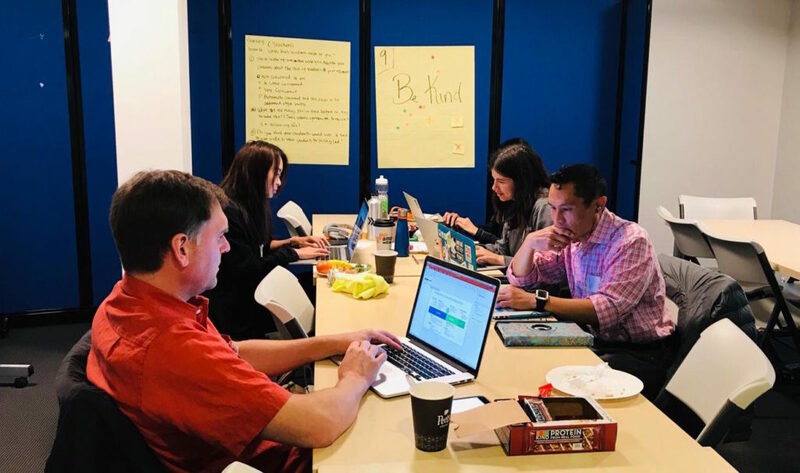 We had 54 hours to form small teams around a problem in our education system and create a prototype and a pitch for a new edtech startup to address that problem. Out of 30-some ideas, we voted on which ones we were most interested in. The proposers of ideas with the most votes then had an opportunity to try and assemble a team to work on their idea that weekend. I have lots of education problems that are close to my heart. I pitched one that I’m passionate about: helping students learn how to engage and understand others who were different from them. I actually got a lot of votes for my idea, but wasn’t able to gather a full team to implement it. So I decided to support a team working on a similar idea: getting kids to express more kindness toward each other. So by Friday night we had our teams and ideas set. The real work would start on Saturday morning. Among all these, we had to pare down our product idea to something that could be tested and implemented in a weekend. Core Problem: In order for students to succeed in school (and life), they need an environment where they are treated with kindness and respect. Acts of bullying, insults, and aggression have negative impacts on student self-esteem, confidence, and performance. Target Audience: Middle school students. With teachers being the main managers of the tool. Solution: BeKind is an online, web-based system for middle school students to identify and record acts of kindness, generosity, and compassion for each other. Students earn points for observing acts of kindness, which is displayed as a total for their class or grade. Teachers can see all acts observed by their students to assess how they are treating each other. Parents can see how their own student is doing, to get insight in their actions outside of the home. The website would be accessible both in the classroom and on the students’ phones wherever they were. Next we had to test out our idea to see if it made sense. We realized that we needed the buy-in of both educators and students if this product was to be successful. So we came up with a plan to quickly pitch our idea to as many young people and teachers as we could. For teachers, we drafted up a quick survey that we then sent out via our social networks. This was incredibly successful, with more than 30 teachers answering our survey. We also got individual teachers and administrators on the phone to have more detailed conversations about our product idea. Students were more of a challenge. Luckily Ryan was the father of three kids of about the right age demographic. So he was able to interview them and get their ideas and impressions. The rest we had to go out and find on the streets of San Francisco. Two of our team members went out to poll eight young people in this way. We got some excellent feedback on our idea, which shaped how we built out the prototype. Lots of kids were skeptical if it would be effective, but they liked the idea of it being done as a competition among classes or grades. Teachers were very supportive of a tool that would foster more kindness among their students, and liked that they didn’t have to be doing the observations. Many of them already had existing curricula and programs at their schools focused on fostering pro-social behaviors and attitudes among their students. We had evidence we were on the right track! Having validated that we had a solid idea for a product, we worked on building a working prototype and demo. This was largely the work of Laura, our software engineer, and L, who had some background in design. The rest of us helped scope out the range of features and functionalities that the tool would have. Laura built out a simple but functional website where the user could select from a dropdown menu of actions and another menu of students to report on what they had observed. 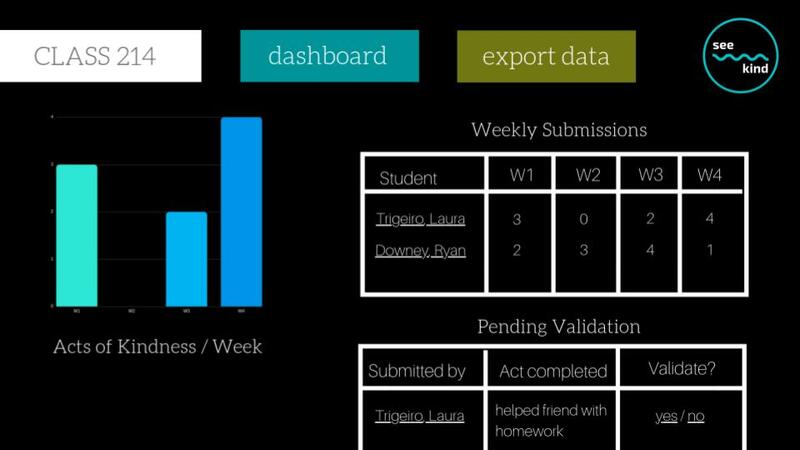 L. created mockups of other pages, including the student dashboard showing her own actions and those she had observed, a teacher view showing all the actions of her students, and an administrator view showing actions across an entire school or a school district over time. I was so impressed by what they created in just a few hours. The business plan was led by Jack and Ryan, who had the most background in this area. 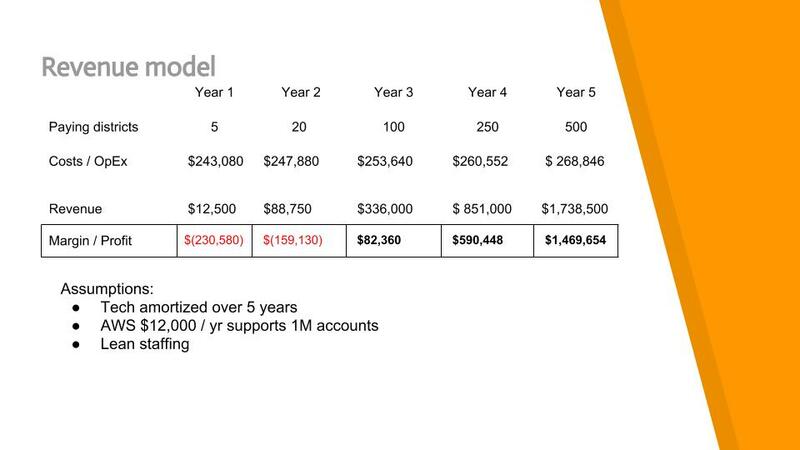 They came up with complicated models showing what the overall market for the product was like, who the likely competitors were, how our product fit into the marketplace, what our operating costs were, and how we would raise revenue. I was so thankful for their expertise. 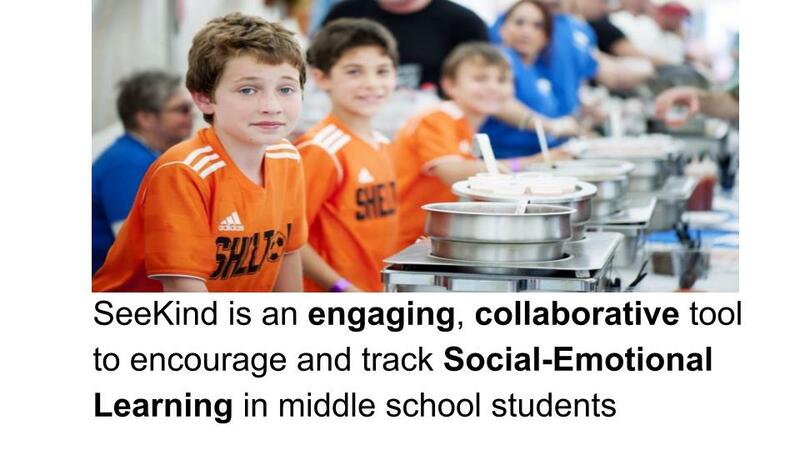 I concentrated on understanding the larger field of social-emotional learning (SEL) that our product was connected to. We soon discovered how large this area of learning was in K-12 schools across the country. Each year $640 million dollars was spent on SEL programs, $180 in middle schools alone. Programs ranged from professional development trainings to curricula packages, motivational speakers, video series, classroom materials, and online platforms. The more I studied about what was being done, the most convinced I became that our tool, now called SeeKind, had a lot of potential to fill a necessary niche in the market. Because while all of these interventions seemed quite promising, the methods of assessing progress on improving SEL competencies seemed pretty crude. Many of the assessments seemed to rely on teacher reports of changes in student behavior or attitudes, surveys of students, or incidence of negative behaviors like violence and bullying. SeeKind offered a new way to assess whether an SEL initiative was working or not, by giving students themselves the power to observe and report on what pro-social acts their fellow students were engaging in. One middle school teacher I talked to thought that SeeKind could be a great tool for a teacher to have in their toolkit to engage with their students, and get a sense of how they were doing both in the class and outside of it. Another assistant principal of a middle school in New York said she would definitely use this in her school. Saturday came and went like a whirlwind. Sunday was our time to prepare and deliver our pitch to a panel of edtech experts. It was time to stand and deliver. I drew the short straw and was chosen to lead the pitch for our team. Each team had exactly five minutes to present their pitch to the expert panel, including a short demo of their product in action. The panel could ask questions for no more than four minutes. Condensing all of our work up to that point into five minutes just sounded impossible. We decided we wanted to do something a little different to open our pitch – a dramatic demonstration of how our tool would work. While the whole team stood on stage, I introduced us. Ryan then did a very convincing stumble and a fall, dropping a bunch of papers on stage. L then stooped over and helped him pick them up. Lenka dramatically said “Hey, that was an act of kindness. I should record that!” while tapping on her phone. I then proceeded to describe SeeKind to the judges and the audience. I think I did a decent job expressing our main points that we wanted highlighted: this was an engaging tool for teachers to engender social-emotional learning in their students and to track the results. There was a clear market for the tool. And it seemed to fill a niche that no other product was providing. It was really interesting seeing what the judges valued in the pitches and the products. 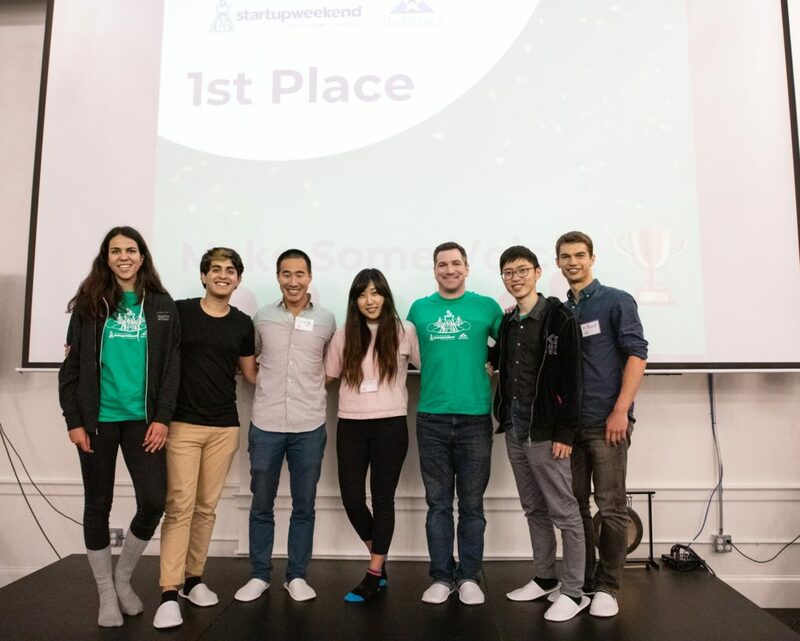 All of these pitches had a clear concept that was well articulated, a product that seemed possible for a startup to develop in a reasonable timeframe, and a well-thought out plan to get the product into the education marketplace. I still think our product idea is awesome and I’m proud of the work that we did. But I see how we could have done a better job articulating our excellent business plan and telling a more compelling story of how it could have a significant impact on educational outcomes. As my first real hackathon experience, I could not have asked for more. It was a well organized event, the volunteer staff were super friendly and helpful, the facilities were well-suited to our needs, and we had plenty of delicious food and beverages the whole time. 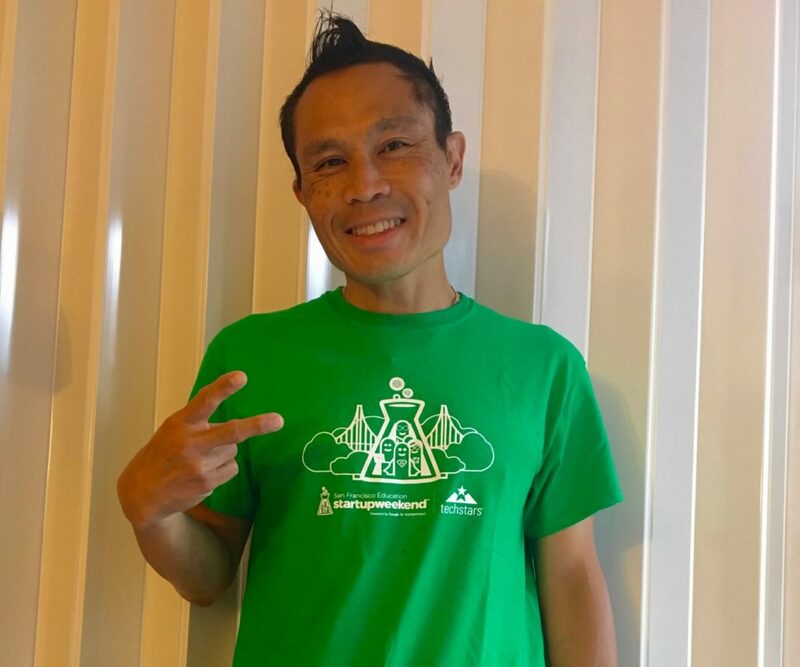 Lee Ngo did a fantastic job as our MC for the weekend, keeping us inspired, entertained and on track to get to the finish line. Most importantly, I got to spend the weekend working on a topic I was passionate about, with a diverse, talented team of people all united around the same goal. For me, I had no real expectations other than to learn about the edtech field and gain a deeper understanding of how a business idea is created and brought to market. I got all that and so much more. I now know a ton more about the field of social emotional learning. I’m so inspired by all the ways that teachers, administrators and counselors around the country are focusing on developing this necessary set of competencies in their students. Goodness knows, we need more empathetic, self-confident, kind young people in the world. I also have a deeper appreciation for all it takes to bring a new digital tool, product or service to market. Market validation, prototyping, expert consultation, business analysis, and marketing are all valuable processes I got to engage in for a short, but intense few hours. And lastly, I got a lot of validation that my own skill-set and experiences as a Digital Learning educator, an instructional designer, a youth development expert, and a facilitator are useful in settings like these. I feel much more confident that I have a place and something to contribute to this field. That alone was worth the price of admission. I am so thankful for my awesome teammates Laura, Lenka, L, Ryan and Jack. We had our tense moments, but overall we got along and worked together incredibly smoothly. I couldn’t have asked for a better gang to build a startup with for 54 hours.